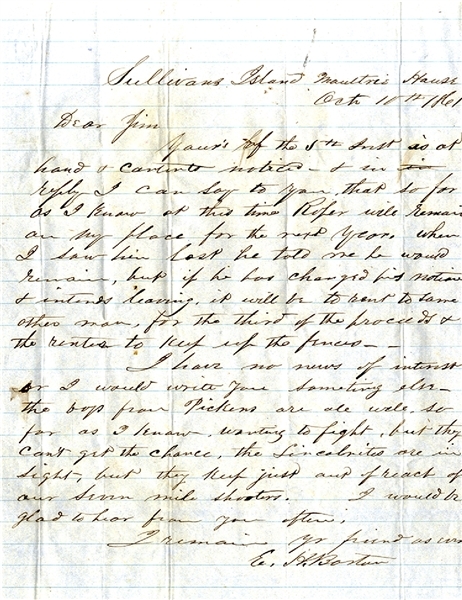 War-date Confederate soldier Autograph Letter Signed by Edward H. Barton, 1st South Carolina, Orr’s Rifles, who later served with the 2nd SC Rifles and surrendered at Appomattox Court House with Robert E. Lee, 1pp. quarto, Sullivan’s Island, October 10, 1861, and reads in part: “...The boys from Pickens are all well so far as I know, wanting to fight, but they can’t get the chance. The Lincolnites are in sight, but they keep just out of reach of our seven-mile shooters...” Fine condition.